No, maybe the GPS screen, like in the Discus but I don't know yet. Has this plane actually night lightning? If yes, have you thougt of including some kind of the new landing lights of the Airbus Project, that really lights up the scenery? any chance on getting the awesome lights that will be on the a320/1 ? the ones that light up the buildings? Great pics, it's nice to see that these planes are also getting attention. Unfortunately for me it means I have to continue searching a HK36TTC for FSX. We used to hire a HK36 for towing of gliders. Yep, I flew ASK21 and LS-4 several times behind a Super Dimona. It was great, because the HK36 was able to climb much better than the DR400. 27 as mentioned in the first post. Joa took me up for a flight in it. 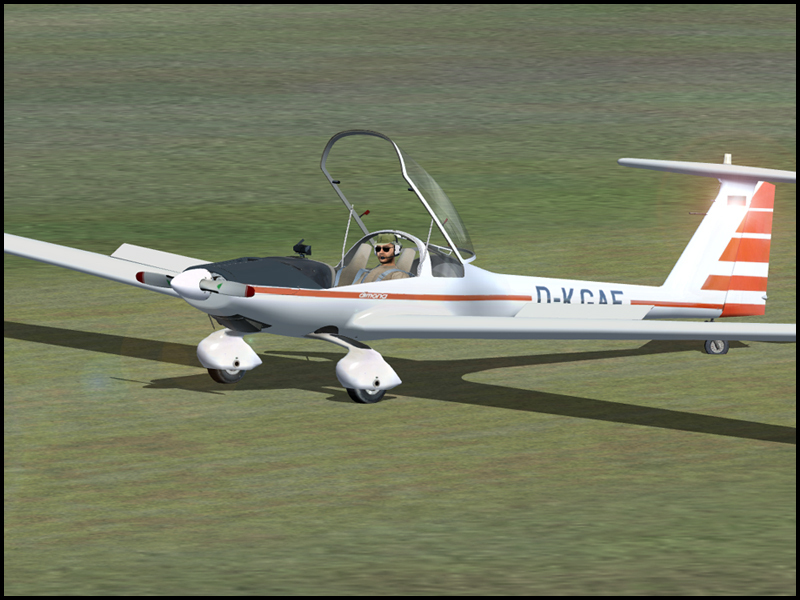 Strange aircraft, very docile to fly, you normally need 30 minutes to get the stick/rudder right but I was able to get 'acceptable' coordinated turns after a few minutes (try that in a Super Cub). Joa had me do side slips after very soon and they also felt very controlled. The only thing that was weird was the very large stick forces you needed. This is most certainly not an aircraft you fly with two fingers. Having been used to aircraft that even thinking about a turn starts the turn it was strange for me. Like flying a 1960 airliner. It should be around in the next 6 weeks or so. Are you able to show a few pictures? Will thermalling be possible in this aircraft? I mean in the sim. Of course, as "good" as in the real one. Beautiful! Great work again, Joachim! Brings me a lot of nice memories of flights around Germany back. Once we have been in Hannover. Ground control made a joke out of it and parked us between two A320. What a picture; a little Dimona between heavy metal.. This must have looked cool. Do you have a photo? sure, but they are on my PC at home and I'm at the cottage/airfield over the weekend. I can post one or two tomorrow evening, if it's okey. seems that users are not allowed to attach pics in the preview forum. Especially that L-1011 in the background of the 4th photo...! you meant the release would be around summer, now summer is going to an end. when will the release come? you worte the release would be around summer, no summer is going to an end. when will the release came?